Since it’s getting warmer outside I know most people are getting out of the mood for soup but I promise, this soup is good no matter what the weather! It’s easy to prepare, hearty, and loaded with fresh veggies and flavor. And if you’re short on time, the keto meatballs can be made ahead of time or even frozen. For the meatballs, I’ve added some sneaky veggies. I add an onion, 2 handfuls of spinach, and 3 cloves of garlic to a food processor and process until everything is in very small pieces. Then, I add the spinach/onion mixture to a large bowl along with 2 lbs. beef, sea salt, pepper, Italian seasonings, and parsley and mix everything together. Then I roll the mixture into meatballs and bake at 350 degrees for 35-45 minutes. 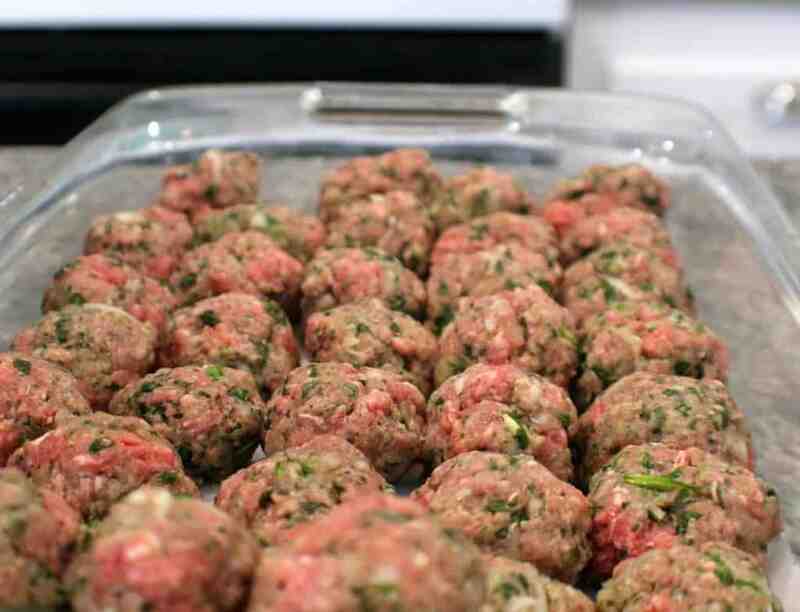 The meatballs are also great on their own, as a snack, in lunchboxes, or with lots of dishes!!! While the meatballs are cooking, I make the soup. For the soup I saute carrots, onion, celery, and garlic in a heavy-bottomed pot. Then I add basil, oregano, thyme, tomato paste, a bay leaf, chopped zucchini, diced tomatoes, and chicken broth. I let that simmer about 20 minutes to infuse all that yummy flavor. When it’s done simmering I add some balsamic vinegar for nice depth of flavor, salt, pepper, and the meatballs. Then it’s ready to eat!!! And whatever is leftover (if there is any) can be stored in the fridge or it also freezes nicely. 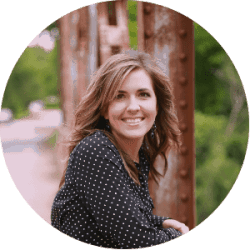 Looking for more Whole30 & Keto Dinner Recipes? Check these out! Preheat oven to 350 degrees and line a 9x11 inch baking dish with parchment paper. 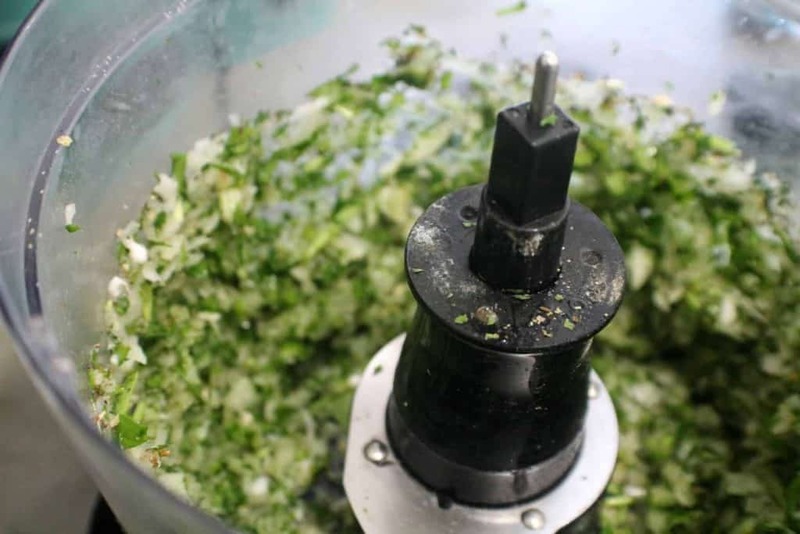 In the bowl of a food processor, add the spinach, garlic, and onion. Then process until everything is in very small pieces. Add the spinach/onion mixture to a large mixing bowl along with the ground beef, sea salt, pepper, Italian seasonings, and Parsley. Mix well. Roll into meatballs and place into prepared baking dish. Bake for 35-45 minutes, or until cooked through. Add the oil to large heavy-bottomed pot or dutch oven and heat over medium heat. Add the onion, garlic, carrot, and celery. Saute until veggies are slightly soft, around 4 minutes. Add the basil, oregano, and thyme. Cook for 1 minute. Add the diced tomatoes, tomato paste, bay leaf, chicken or beef broth, and zucchini. Bring to boil, then reduce heat and simmer 20-25 minutes. Add salt, pepper, and balsamic vinegar. Taste soup, if it tastes flat, it needs more salt. 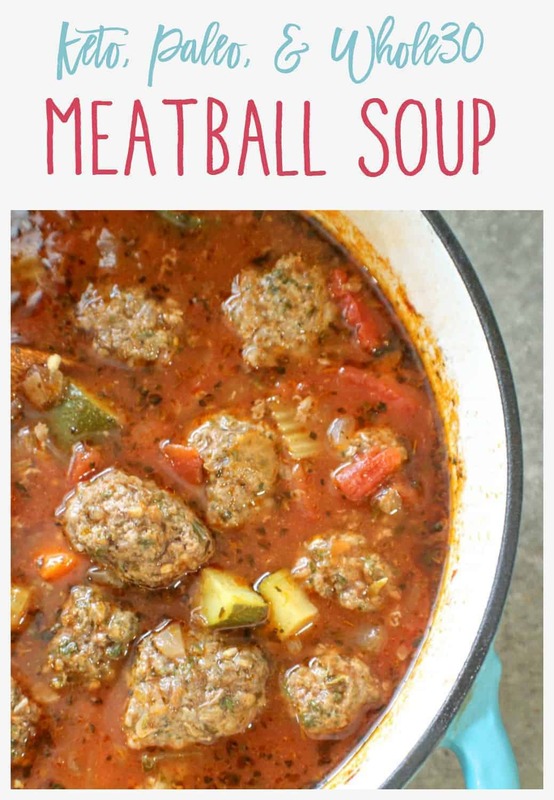 Add the meatballs to the soup and serve! To make this lower-carb, omit the carrot, zucchini, and reduce the onion to 1/2. This will make one serving have 7 net carbs. Hi! Im an amateur cook. This recepie looks so good and i cant wait to try it! But sadly i dont have an oven, do you think it will taste the same if i fry the meatballs instead? Will they fall apart? 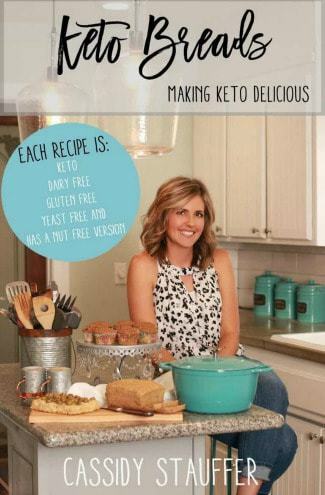 Hi Cassidy….this recipe looks delicious….what size do you recommend for meatballs? 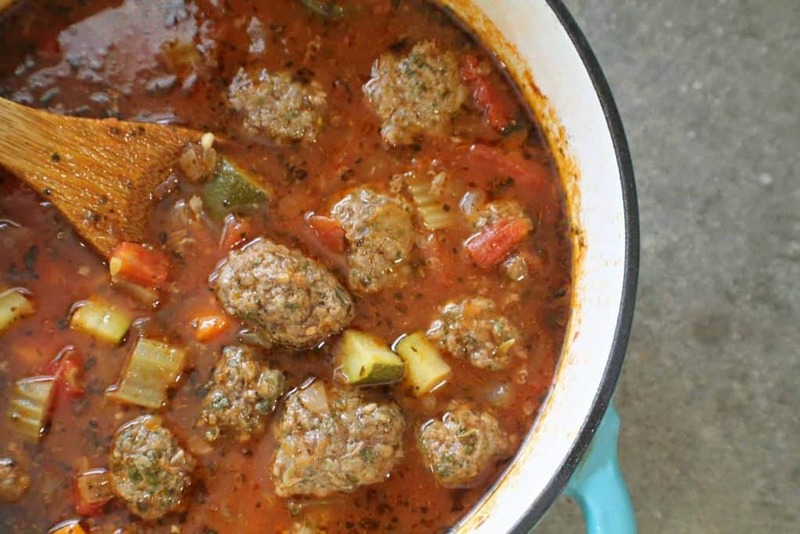 Seems like a lot of meat to put in 9 x 11 pan…do you stack the meatballs? Hi Gwen! I usually make mine roughly between 1 to 1 1/2 inches around, and yes I do slightly stack the meatballs towards the edge of the pan cause it is quite a bit, lol! Do you need to add any eggs to the ground beef mixture to hold the meatballs together? The most flavorful tasting soup. I made tiny 4 oz meatballs which I browned in fry pan first. We like spice so I added extra garlic, salt and celery flakes, onion powder and pepper. Absolutely delicious. Wonderful I could eat it everyday! My family loves this recipe! It is delicious and I have used the meatball recipe for other things also. I was wondering if there was a way to do the whole thing in the instant pot? If so, do you have directions or guidelines for that? Thanks for the delicious recipe. Hi Licinda!Thank you, I’m happy you like it! I’m sure it could be made in the Instant Pot, but I don’t have directions for it yet. I’m going to try to get Instant Pot directions soon though, sorry! 5 Stars all the way!!!!!!! !Thanks so much for sharing. Mama Mia this soup is fantastic! Very filling & satisfying. I grew up with Italian Grandparents. Whenever Nanny would make zuppa (soup) she always sprinkled a small amount of Parmesan on top . I did the same & highly recommend! I love the texture that baking the meatballs first versus putting them in the soup raw makes. I made them big…thinking next time I might make mini meatballs….we’ll see. Thanks Again for an awesome recipe. Can this be made in a Crock-Pot? I don’t see why it couldn’t be made in the crock pot, but without trying for myself I can’t give you temperature or cooking times. I’ll have test it and get back with you! If you give it a try be sure to come back and tell me how it turned out!!! I love this soup! You can make it in an instant pot too and it comes out great! 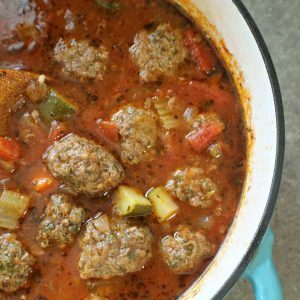 Just do the soup in the instant pot and meatballs in oven. My picky child with autism loves it too! Fabulous! Just made this tonight, and it was wonderful! I are a bowl, and had a hard time not going back for a second bowl. It’s so full of flavor! Thanks for the recipe, this is going into my regular rotation of winter soups to make. Thank Melony!!! You have more will power than me, I usually can’t help myself and end up getting 2 bowls ? Where is all the sugar coming from? The carrots? I am starting Keto, and I have been told NO sugar. 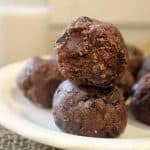 This recipe looks really good but I can’t eat unless I know where the sugar is coming from and maybe I could change the recipe to fit Keto. Thanks. Hi debbie, the majority of the carbs are coming from the carrots, onions, zucchini, and tomatoes. Pretty much everything has carbs except fat, eggs, and some meats – even spices have carbs! I have notes right under the recipe though that will reduce the net carbs to 7 per serving – and the servings are quite large!!! Sorry I can’t get it down to 0, but I hope this at least helps! Loved the soup. Next time I will add one more zucchini, a small handful of cabbage and /or spinach. My dog loved the extra broth from my bowl. I’m glad you and your dog liked it! Adding cabbage or spinach is a good idea, I’ll have to try that next time – thanks! Thank You for the recipe. It came out delicious. Tho the meatballs came out dry. I did make them about 2″ and cooked them for 45 min. Should i have cooked them for 35min? Hi Mel! I’m sorry the meatballs turned out dry. And yes, I think reducing the cooking time a little bit next time should help!